I think shadow boxes are just magical. They combine two things I love, the first is boxes. I love them, I collect them, I buy them even if I don't need them. You can put all your treasures, memories and secrets in a box. The second thing is touching. One of the reasons I love traditional scrapbooking and not digital is you can feel the page. You can touch it, go over all the elements with your hand and bond with them. Bond with the story. So a shadow box is a mixture of the two. It's a fabulous place to keep small treasures and memories, but they are not stored behind the lid they are speak to you directly. 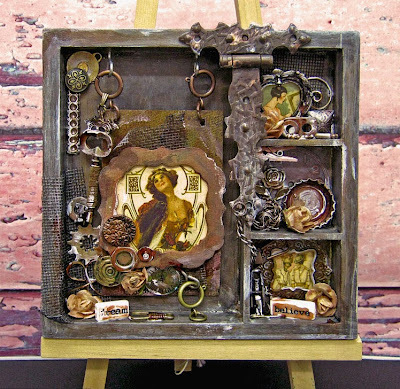 I created this shadow box with a romantic steampunk style that I achieved by using a patterned paper from the Le Romantic collection by Graphic 45 combined with metal embellishments and an industrial colors. In this project I used a few really fun and interesting techniques like: paint layering, building a hanging mechanism and embellishments layering as well. 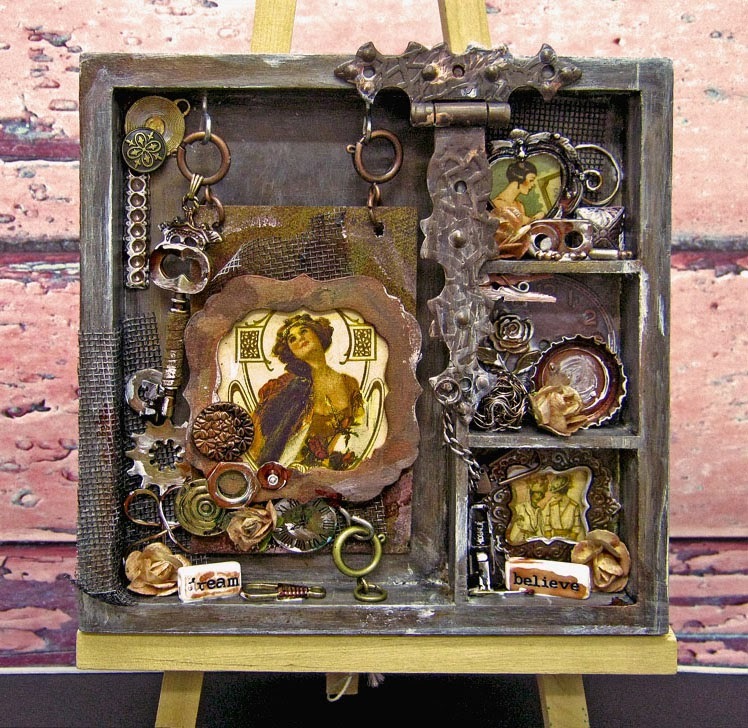 Watch the step by step video tutorial to learn all the techniques and create a shadow box from start to finish. לא בטוחה שזה ממש סטימפאנק (יש פה יותר מדי נשים יפות ופחות מדי חלקים מכניים, לדעתי, ככה שזה יותר וינטג', את לא חושבת? ), אבל מה זה חשוב? התוצאה מקסימה ואני מאוד אוהבת את תשומת הלב שלך לכל פרט ופרט! ואני מאוד מסכימה איתך לגבי היתרון של הקראפבוקינג המסורתי על פני הדיגיטלי! nice! I love your blog!